TBILISI, DFWatch- The possibility to study Georgian intensively for one year and then to continue studies in any Georgian university seems like a great opportunity for students coming from ethnic minority background. How helpful is the integration program currently being implemented by the Ministry of Education of Georgia? 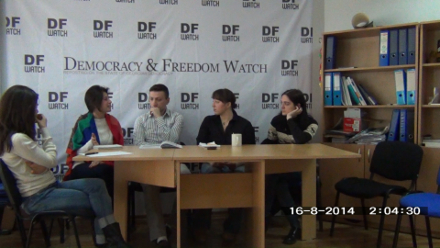 DF Watch discussed this with Inga Karazian, American International Politics MA student at International Black Sea University, Giulyanchan Ayalova, who studies business administration in Ilia State University and Giorgi Bobghiashvili, a project associate from European Center of Minority Issues (ECMI) Caucasus regional office. The participants of the discussion agreed, that the current integration program is a huge help for young Armenians, Azeris, Ossetians and Abkhazians who want to get their bachelor’s diploma in Georgia. Although neigher Karazian, nor Ayalova are beneficiaries of this program, they said that they know a lot of students who are taking part in it, and are satisfied. However, the discussion showed that even if this integration program has some serious potential, there are still some things to be ironed out. For example, it is quite easy to abuse the quota system, and there’s a lack of transparency in finances. The participants also noted, that it is important to improve Georgian language teaching in ethnic minority schools in addition to this one year pre-university preparation. In 2009, the Ministry of Education introduced a quota system in order to help ethnic minority students continue their post-secondary education in Georgian universities. In a nutshell, this affirmative action scheme assigns 12 percent of all bachelor or academic certificate level academic placements to students with ethnic minority background. Armenian and Azeri students each are allocated 5 percent of all academic placements, and Ossetians and Abkhazians get 1 percent each. 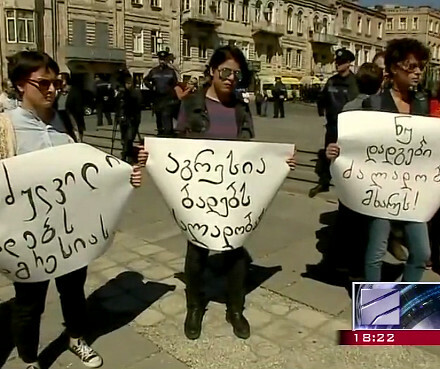 These students can get into university passing just a General Skills exam in their mother tongue, but they then have to spend an extra year learning Georgian language before they can start their selected study programs. The program, referred to as “1+4”, will continue until 2018-2019 school year. 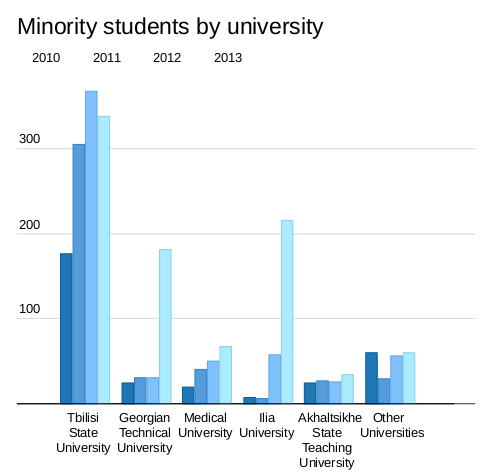 In the first three years, the number of ethnic minority students enrolled in this program tripled from 301 students in 2010, to 928 in 2013. However, there are more allocated places than actual students. For example, in 2010 only a bit more than 11 percent of all 2602 places were used, and in 2013 this number was 24 percent (928 out of 3900). The absolute leader is Tbilisi State University with more than 300 ethnic minority students enrolled into “1+4” program in 2013. Ilia State University, Georgian Technical University and Medical University are also popular among these students. The program is also seem to be more popular among Azeri students, than among Armenians. As it is shown in the graph below, there are more Azeri students who passed the General Skills exam in their mother tongue than Armenians. One of the possible explanations, offered by Inga Karazian, is that Kvemo Kartli, where the majority of Azeris live, is closer to Tbilisi than Samtskhe Javakheti, thus students can commute easily to the universities, even from home. Neither Karazian nor Ayalova are beneficiaries of this program. Karazian got her BA in a Russian-language university in Yerevan, and now came back to Georgia to continue her education in English-language International Black Sea University. “ I came back to Georgia, because my family lives here and I feel more comfortable here,” Karazian explained and added that it was hard to come back and try studying Georgian almost from the beginning, as her secondary education was in Russian. Even if they are not getting any benefits from this integration program, they both agree that this scheme is important for their Azeri and Armenian counterparts, so that they could learn Georgian and get a university degree. And affirmative action is helpful. 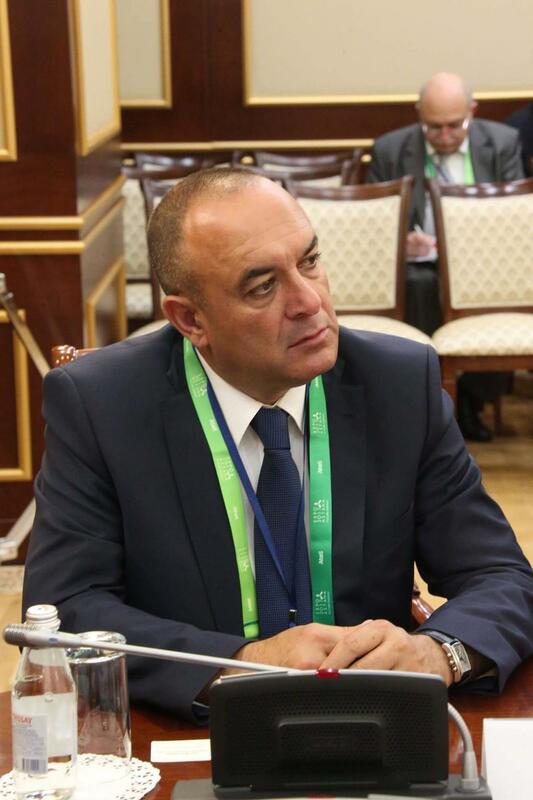 “Of course such quotas are good for ethnic minorities, but I think that as long as you are Georgian citizen, you should be evaluated compared with everyone who applies,” said Karazian. Bobghiashvili pointed out that one of the flaws of this program is that it allows ethnic minority students to get into universities easier than their Georgian counterparts. 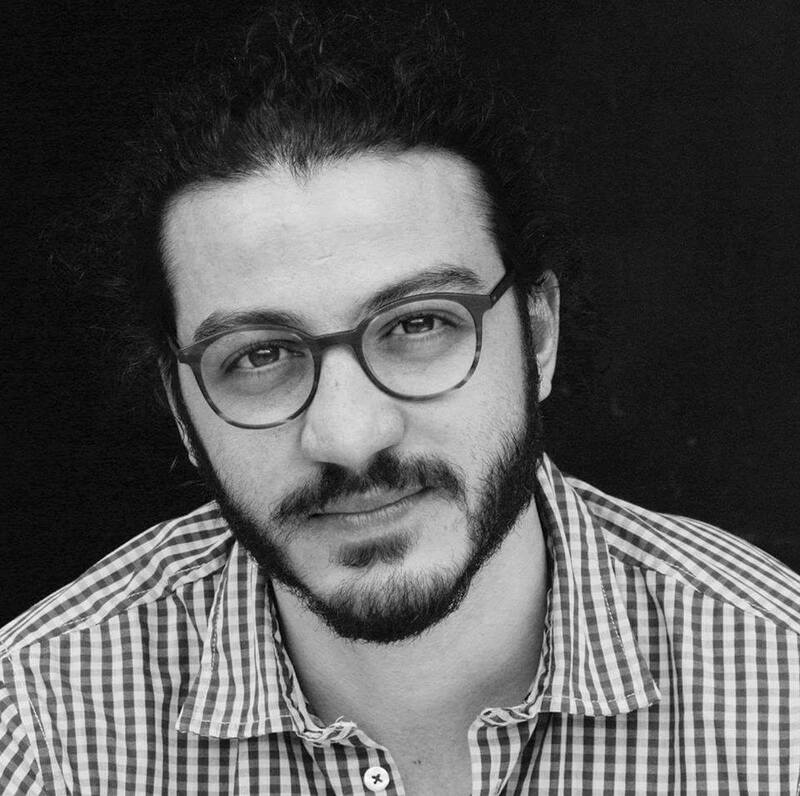 “Even those who can study in Georgian, are starting to use this quota system in order to get study grants. 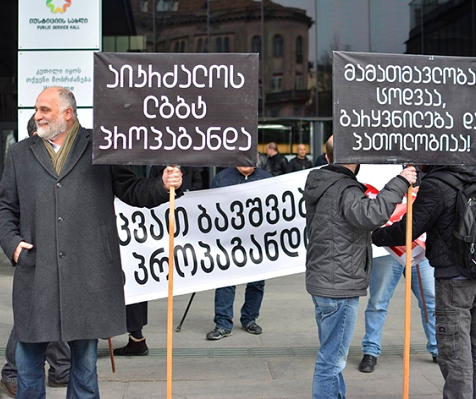 <..> First, it is easier to get in, as quotas are not filled in, and secondly, as there are a hundred study grants allocated to each minority group, it is easier for them to get free education than for Georgians,” Bobghiashvili stated his position. 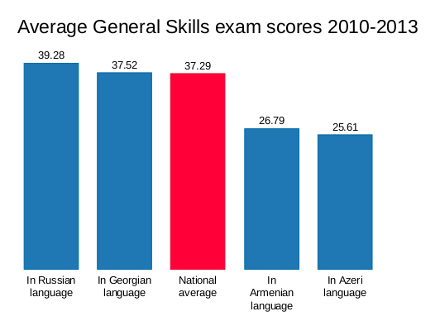 The graph below illustrates this point: on average, Armenians and Azeris get lower scores in General Skill exams, taken in their native languages. But the quota system ensures, that they get into universities even with lower scores. But not everyone tries to find the easiest way to get an education. For example, Ayalova said that she had good enough General Skills exam score to get into a state-funded place through the quota system, but she decided not to go that way. “It is better for me to study with Georgians. I am the only Azeri there, it is easier to learn the language that way,” Ayalova explained. Another problem with this scheme, according to Bobghiashvili, is a lack of transparency. “For example, there are a lot of students in Tbilisi State University who participate in this program, the state gives a lot of funding, but it is not clear where a lot of money goes,” explained the ECMI specialist, pointing at the report by Shalva Tabatadze and Natia Gorgadze, which evaluates the effectiveness of the quota system in 2010-2013. 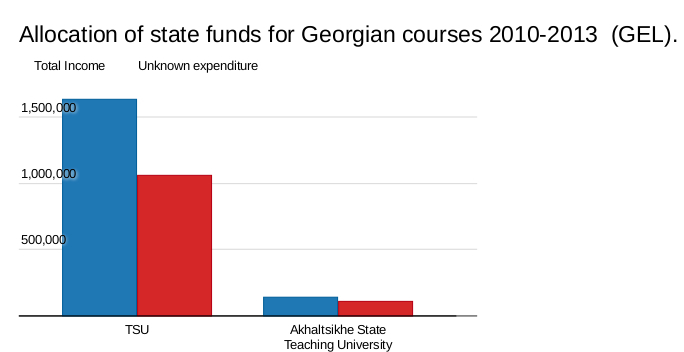 For example, out of 1.6 million laris, received by TSU in 2010-2013 as Georgian state grants for ethnic minority students to study Georgian, 560 000 went to teachers’ salaries and about 10 000 for stationary, books and other expenses. But it is not clear how the remaining 1 million laris were spent. It is a similar situation in the other universities, which have a relatively large ethnic minority student population, such as Akhaltsikhe State Teaching University, where out of 137 500 laris allocated for the integration program, 109 670 is unaccounted for (see diagrams). 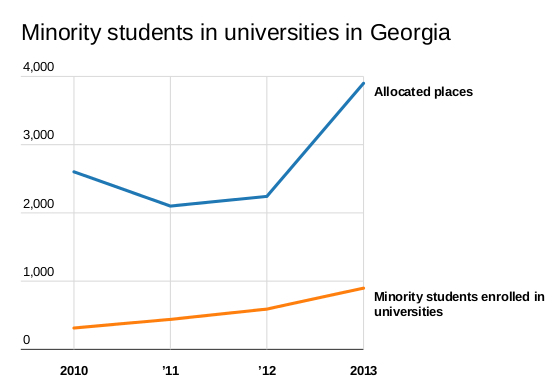 But it also should be mentioned that higher education institutions less popular among ethnic minority students, for example Kutaisi, Batumi or Telavi universities, spend more on teaching Georgian language than they get from the state. However, as it was already mentioned, despite these flaws in implementation, the participants of the discussion agreed that such program was needed and is helping ethnic minorities’ integration process a lot. You can watch all discussion here. All graphs are based on Tabatadze and Gorgadze report Evaluation of the Effectiveness of the Quota System in Georgia 2013.